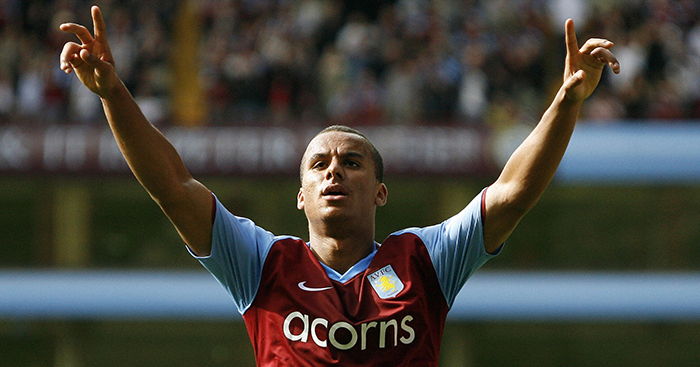 A decade ago, Gabriel Agbonlahor scored an eight-minute hat-trick and was tipped as a future England star. It never quite happened for the Aston Villa man. Hindsight is a blessing and a curse. It makes scholars of those in the present and fools of those in the past. It ridicules the speculators of yesteryear and equips those in the now with a pedestal for dispensing scorn and ridicule. With hindsight, we all think we knew it all along. The beautiful game being… 4 x 100m relay? In fairness to the rugby journalist — a fairness that may or may not be deserved — November 2008 was a very good time for Gabriel Agbonlahor of Aston Villa. After starting the 2008-09 season with a ‘perfect’ eight-minute hat-trick against Man City, the striker was on course for his long-expected England debut. It arrived shortly after Bills’ article. In a friendly against Germany on November 19, Agbonlahor started up front, not with Theo Walcott, but with the similarly slight and pacy Jermain Defoe. The Villa man terrorised the German defence, earning plaudits from captain John Terry. He even had a goal disallowed. But Agbonlahor would rarely again scale such heights. It would be the first of just three caps for the Birmingham-born forward, whose goalscoring ability would all but desert him by the age of 23, returning only in brief patches over the next eight years. What happened to the lip-wetting hope of English football? In the four Premier League seasons between 2006 and 2010, Gabriel Agbonlahor scored 44 goals at an average of 11 per season. Although he never reached the tally of an elite striker, this era represented a high point for the forward, who was praised for direct style and running speed. Walcott, with whom Agbonlahor would never form that mouth-watering strike partnership, talked up his compatriot in February 2008. Not content with dreaming up the Agbonlahor-Walcott partnership for the England side, the aforementioned Bills even suggested that Arsenal might sign the pacy Villa star. At the end of 2008-09, Agbonlahor was nominated for the PFA Young Player of the Year, but those hypothetical cheques never arrived. For better or worse, the player remained with his hometown club. And then the goals dried up. Between 2010 and Villa’s eventual relegation in 2016, Agbonlahor scored just 28 Premier League goals at an average of less than five per season. By common standards, this should have been his peak, playing from the age of 23 to 29. For Agbonlahor, however, it represented a surprising early retirement from goalscoring duties. The only high point over that period was the 2012-13 season, in which Agbonlahor provided an effective foil for target man Christian Benteke, scoring nine goals to the Belgian’s 19. That season was followed by one of the stranger moments in Agbonlahor’s career. On September 8, 2013, the forward took part in a charity match organised by Villa midfielder Stilyan Petrov, who had been diagnosed with acute leukaemia in March 2012. With a Stilyan Petrov XI leading a Celtic XI 3-1, Agbonlahor flew into a tackle on Louis Tomlinson, a member of the pop band One Direction. So aggressive was the challenge, Tomlinson limped around for a few minutes before eventually vomiting on the sidelines, earning him the nickname ‘Spewy Louis’. Agbonlahor had a new enemy: not Birmingham fans, but fiercely loyal tweens promising to avenge their singing hero. From then on, a useful if non-scoring forward turned into a genuine villain. Villa endured a horrendous 2015-16, using four managers and ultimately finishing last in the league. Although much of the fans’ ire would be directed at car-tweeting defender Joleon Lescott, Agbonlahor faced criticism for a perceived party lifestyle. After scoring just one league goal all season, the forward was spotted smoking a shisha pipe on a boozy holiday in Dubai, and later with nitrous oxide balloons. These were hardly the severest of crimes, but it was only March. From the outside, the Villa team appeared to have accepted its looming relegation. To see that resignation in a homegrown player, a player only recently appointed club captain, was hard to swallow. But if Championship football appeared to offer Agbonlahor a chance to rediscover his scoring form against inferior opposition, the reality proved different. Having resigned as captain after the shisha incident, the forward scored just one goal over 2016-17. It came, fittingly, in the derby against Birmingham, but the 30-year-old was running on empty. He made just six appearances the following season, again scoring once. Agbonlahor was released at the end of 2017-18, never found another club and eventually announced his retirement in March 2019, still only 32. How he must have wondered what might have been. Can you name Aston Villa’s top 20 scorers of the Premier League era?